Looking for that special wedding dress? A dress that will fit your very special day? According to the best selling book of all time, the first bride in history didn’t have to worry about finding the perfect wedding dress for her garden wedding. Instead, she just showed up in her birthday suit and her man didn’t seem to mind at all. Well, as the story goes, things got a little complicated for Eve and Adam after that. And ever since then, any bride who shows up in that original outfit will either catch a cold or get arrested. Today the search for the one perfect wedding dress is a monumental task. And if you are so blessed to be in the market for one, it can be very daunting. So, to make your preparations and your big day easier, we’ve compiled some of the most stunning and popular wedding dresses ever created. It is our hope that it will help you in your search to find that one special dress that makes you – and your wedding – even more beautiful. 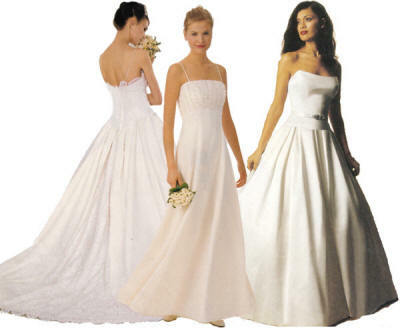 Find the perfect wedding dresses, bridesmaids dresses or flower girl dresses at any of our sponsored links.